Singapore Tattoo Show 2010 is anticipated tattoo event in Singapore for the 2nd time with more fantastic tattoo artists from across the worlds to showcase the art of tattooing. The Singapore Tat2 Show hopes to further educate and reinforce to the public and tattoo enthuastists in Singapore about this inspiring ART form that has fascinated and enchanted generations down becoming a major influence in our lifestyle today. 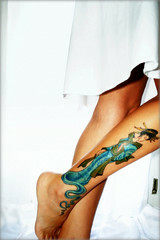 If you are really into tattoo, don’t miss the top tattoo artists at Singapore expo from 8 till 10 Jan 2010. To find out more about this tattoo show in Singapore, visit the official website tattoo.com.sg.